The NexDose® medical digital assistant is a small, self-contained, mini-computer that helps patients take medication properly. NexDose® manages up to 20 different medications. It is easily programmed by the user. 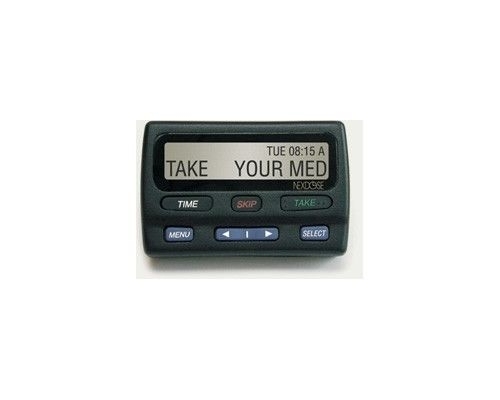 The NexDose® Medical Digital Assistant sounds an alarm when it is time to take a medication, and displays its name. 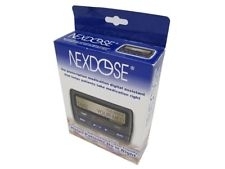 NexDose® gives the patient a user-friendly time range during which it is OK to take the medication. Pushing the TAKE button confirms the patient's action, and NexDose® informs the patient what’s next. Lightweight at only 3.2 ounces, and is powered by two AAA batteries. NexDose Internet Services provide the Healthcare Provider the means to remotely program a NexDose digital assistant and to capture for review patient compliance data stored within the NexDose digital assistant. Small, self-contained, mini-computer that helps patients take medication properly. Sounds an alarm when it is time to take a medication. 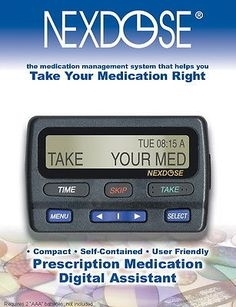 NexDose Internet services provide the healthcare provider the means to remotely program a NexDose® digital assistant.